On my last day in Myanmar, I again arranged for a taxi to take me back to Taung Tha Man Lake. 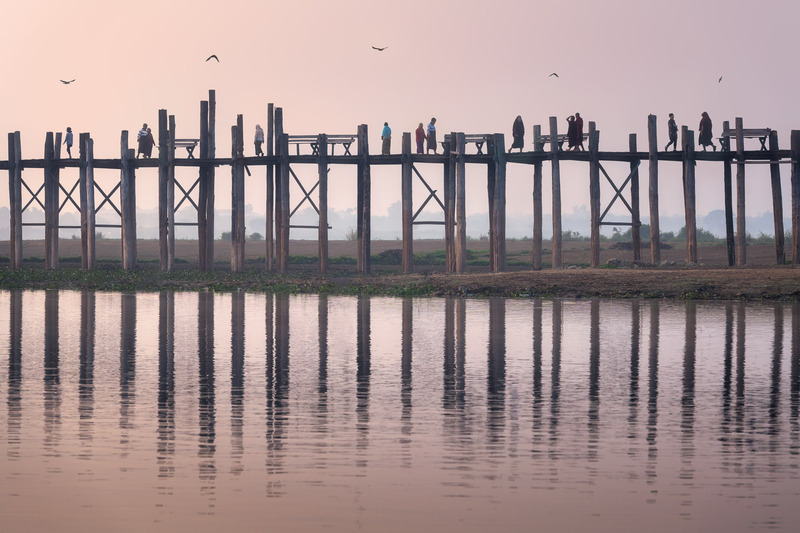 I made no special effort to get there before daylight or just at sunset; I wanted to see the U Bein Bridge as it was meant to be — traversed by Myanmaris simply going about their day. Many of my photographs involve careful planning to capture a place when it is devoid of people so that the viewer isn’t distracted by human activity. In this instance, human activity was the very thing I wanted to preserve. Composite from 15 shots taken during 30 minutes, focal length 160 mm, aperture f/8, shutter speed 1/640, ISO 800, tripod. My travels in Myanmar were among the most meaningful of my career. I went there hoping only to photograph its temples, shrines, and other religious art. I would leave the country with a profound affection for its people, who were among the kindest and most welcoming people I’d encountered anywhere. It was a country that was largely closed to outsiders until the very recent past, and yet I found Myanmaris unfailingly gracious and warm – hearted, patiently answering my questions or guiding me to a tucked-away pagoda not mentioned in the guidebooks. I was saddened at the thought of leaving. But as I watched locals crossing the U Bein Bridge as they have done for nearly two centuries, it occurred to me that this is life: a series of beginnings and endings, leaving one place for another, rising each new day to begin again. Buddhism teaches that Samsara is the endless cycle of birth, death, and rebirth, but another way of understanding the idea is through the literal meaning of the word: “wandering on.” The Buddhist monk and teacher Thanissaro Bhikku describes Samsara as the process of continually creating worlds and moving into them. Each of us, through the countless decisions we make each day, move through this process. Some of those decisions are momentous but most are ordinary and inconsequential, altering our lives in silent, infinitesimal ways. The people on the bridge were going about their daily tasks, the minutiae that make up most of our waking hours. They were creating their worlds and it was time to create mine: I would board a flight for Russia and in days or weeks there would be other travels to new places. I would photograph new people, perhaps on another bridge over a distant lake. I won’t be entirely reborn, however; part of my heart will be here, in Myanmar.